Dr. Crafton, who specializes in cosmetic dentistry, will give you the smile of your dreams! In today’s society, youth and beauty embody the picture of health and positive self-image. With modern advancements in the field of cosmetic dentistry, you can now have a healthier and more radiant smile within days. Porcelain veneers are a popular choice for people who want to improve the look and function of their teeth. Veneers can help brighten teeth that have permanent stains or discoloration and can not be whitened. They may also be used to correct gaps between your teeth, teeth that are poorly shaped or crooked, or teeth that are chipped, worn, or eroded. 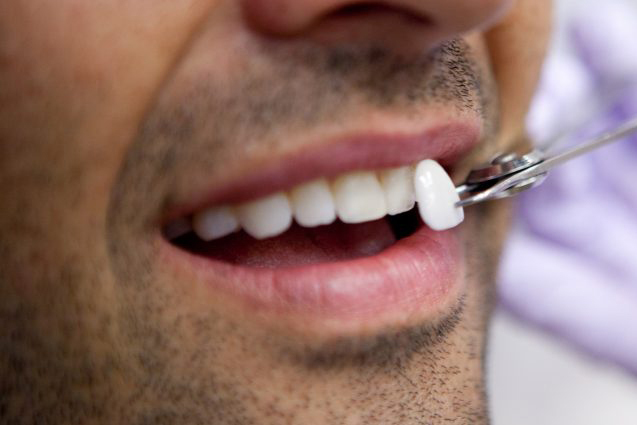 Veneers are ultra thin, custom made porcelain facings that Dr. Crafton affixes to your teeth in a simple, comfortable procedure that requires as little as two appointments. You can whiten your teeth, close spaces, and create a beautiful smile easily. Veneers, which require only a slight reduction in tooth enamel, are bonded to the tooth to ensure a permanent fix. When the porcelain is bonded to the tooth, it becomes very strong and durable. Porcelain replaces the worn or damaged tooth enamel, and the veneer is chemically bonded for strength and durability. Porcelain veneers are aesthetically pleasing, natural looking, and durable. If you want to improve the appearance of your smile, porcelain veneers may be the perfect solution for you. The result of veneers is nothing short of amazing. Since each veneer is individually sculpted to match each tooth, even an experienced dentist will have to get very close to tell your perfect smile isn’t inherited. Your veneers will stay and bright and strong for many years simply by following standard good oral hygiene practices. Schedule a free evaluation with Dr. Crafton to learn more about veneers and what they can do for you!